I wanted to put together a quick post about a couple of channels I have found recently that I think are particularly good for Japanese learners. Nami Ohara is a Japanese teacher based in Newfoundland, Canada. I discovered her videos some time ago and strongly recommend them to Japanese beginners. I am a big fan of her videos which help introduce different aspects of Japanese culture and traditions. In these videos, two young children called Kyoko and Kenta ask their teacher (Ohara sensei) about the topic of the video. The videos are all in Japanese but have furigana readings and English meanings for the vocabulary and phrases used in the videos. I think these are a great way to practice your Japanese listening and learn some new words at the same time. The speech of these videos is much more natural Japanese than what you might encounter in textbooks, so you get used to Japanese as it is actually spoken. If you are studying towards the JLPT, then you might be interested in her JLPT listening practice videos. These are in the same format as the listening questions you will encounter in the final exam. She currently has listening practice videos for JLPT N5 up to and including N2. Besides the JLPT specific videos, there are a number of listening quiz videos aimed at beginners too. Each video is based on a different theme such as nationality and age. If you want to learn some children’s songs, there’s plenty to be found on the channel too! Clearly, a lot of effort goes into her videos, and I hope that by posting about her channel more Japanese students will discover her content. Sambon Juku is a YouTube channel mainly run by Akkie, a Japanese language teacher. I first learned about this channel through a video collaboration he did with YouTuber Kemushi-chan. After checking out his channel, I can highly recommend it to Japanese learners! Akkie has a number of videos covering various topics relating to Japanese study. Most of his videos are explanations for different Japanese grammar points. Akkie’s videos are all in Japanese but he explains everything in a very clear manner and is very easy to understand. If you are an upper beginner and above, I think you will find the grammar videos particularly useful. Having said that, videos on this channel all have subtitles in both English and Japanese. This means all Japanese learners can understand the explanations whilst getting some listening practice. For example, the above video on the differences between は and が is wonderful and probably the best I have come across on this topic, summarising the key differences in usage with plenty of examples. The channel also has a growing number of videos covering JLPT grammar points for levels N3, N2 and N1. If you like the channel Nihongo no Mori, then you will likely enjoy this series as well. I always like to look at different explanations of the same grammar point. Sometimes the way one textbook or website describes things can be unclear, or not have enough example sentences to understand certain nuances. JLPT videos only have Japanese subtitles, but there are normally two sets (one with kanji and kana, one with kana only) which allows you to find the readings for any words you want to look up. It just so happens that the two channels I’ve covered today have JLPT specific content, but I really think anyone studying Japanese can find some value in the videos! What are your favourite YouTube channels? Let me know in the comments! To be honest, I had been putting off joining Instagram because I thought it was too hipster and filter heavy for me. However, I recently decided to join the platform on a whim. Fortunately, I have found it to be a great resource so far for learning Japanese. …amongst other things. You can also change the language to Japanese if you want to immerse yourself a bit more! How can language learners use Instagram? Being a highly visual medium, I think that Instagram is particularly good for learning vocabulary. Using images alongside vocabulary is a great way to help memorise them, which is of course where Instagram shines. Instagram allows you to do short videos, which you can use to practice your speaking skills too. The heavy use of hashtags on Instagram can be considered annoying, but you can use hashtags to find people and posts that relate to topics you care about. Make sure to get involved! Moreover, the Instagram community is all about engagement – commenting is a great way to practice your language skills and maybe even make friends! There is also a translate feature if you get stuck understanding a post or comment. A word of warning though… Instagram is very centered on aesthetic and it is easy to waste time looking at the many pictures of cute stationery, cups of tea/coffee and grammar textbooks. Don’t let scrolling through Instagram become a replacement for other types of study! With that said, here are 10 Instagram accounts that I highly recommend to those studying Japanese. This account is run by a Japanese girl who likes to post content for beginner Japanese learners. Her posts are mostly simple sentences covering key grammar points and vocabulary. Some of these posts have audio of example sentences too. All of her posts have romaji, so if you have just finished learning hiragana and katakana, this is a good place to start (until you feel more comfortable reading kana – which can take more time than you think!). Her Youtube channel has some videos on learning kana, as well as simple Japanese listening practice too. Loanwords can be surprisingly tricky for Japanese learners, but I think that overall words in katakana are a quick and easy way to acquire vocabulary in Japanese. This account will help you get to grips with the many, many words written in katakana that are borrowed from English. If you have just finished learning katakana, these posts are a good way to practice your reading (there is romaji if you get stuck too)! JapanesePod101’s podcasts are a fun resource (although they come at a cost). You may not know that their Instagram page is full of cute images with useful and practical phrases for Japanese learners. I really like the posts where the vocabulary is centered around a specific theme, which is nice for short and sweet study sessions. 4) NihongoLingo – learn Japanese slang! If you want to brush up on your Japanese slang, then this is the account for you! Each post covers a slang word in Japanese with the English meaning. I like that each post has explanations of the word/phrase in both Japanese languages, along with examples and a fun image. This gives you a range of options on how to study, especially if you like to make your own flashcards. As the name suggests, posts from this account are all to do with kanji vocabulary. Each word include furigana, romaji and English translations. The images that come with the vocabulary are all from anime, which is another plus if you are a fan! Yoko is a Japanese person living in Portland, Oregon in the US. Yoko illustrates casual but useful sentences in Japanese and English (with furigana and romaji too!). These sentences are written in a very natural way in both languages. I love the illustrations a lot too! The Kisslingo account covers useful Japanese words, phrases and grammar. If you are working towards the JLPT, I would look out for their JLPT question practice posts too. I particularly like their writing prompt posts where they share a picture and ask you to describe what is happening in the photo in Japanese. This is a great way to practice your Japanese writing, no matter what your language level. What’s more, someone from the Kisslingo team will correct your Japanese for you! Like Yoko mentioned above, Aya posts illustrations of phrases in both Japanese and English pretty much every day. The posts are aimed at Japanese people learning English – but since she includes furigana, Japanese learners can also use them to study. I’ve written before about how important onomatopoeia is in Japanese. If you are looking to improve your knowledge of these words, this account is for you. I love the cute illustrations. The words also have explanations and example sentences which help to show how the onomatopoeia is used! For more advanced Japanese learners (no furigana used here), following this account allows you to read short comics based on everyday life. I find these little comics both relatable and funny, and the images help fill in the context of any words or phrases I am less sure of. So that’s it for today’s post. Please follow the blog’s Instagram at @kotobitesjp if you do use the platform! I strongly believe that studying with sentences is an effective way to learn new vocabulary. If this is something you are interested in, I recommend checking out Clozemaster – a website and app that is built around this concept. Clozemaster is designed to complement the use of other sentence based language learning apps like Duolingo. There are a huge variety of language pairs available, with new ones being added all the time! The “cloze” of Clozemaster relates to a cloze deletion test, where you are given a sentence with a missing word and you need to identify what the missing word is. Cloze tests are therefore a great method of learning to use words and grammar in context. Each language has its own bank of sentences, the number of which does vary depending on the language pair. For many of the popular languages, you can follow the Fluency Fast Track, which is designed to cover the most frequently used words in that language. 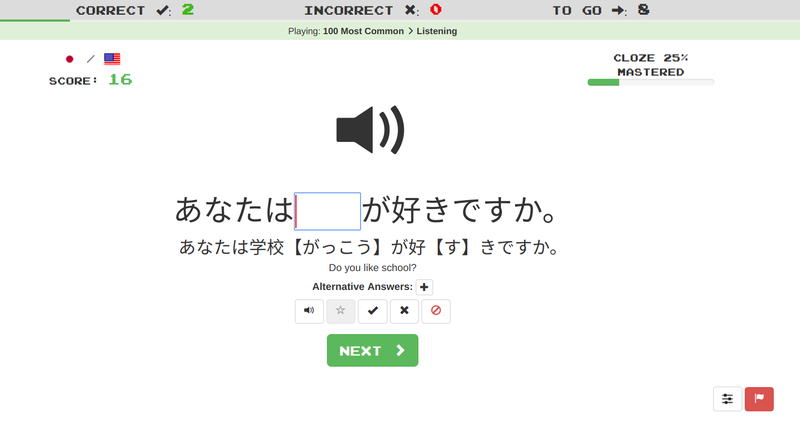 In the free version, clicking ‘PLAY’ will start a round of 10 sentences to review. As I mentioned above, Clozemaster is all about filling in the correct missing word from a sentence. 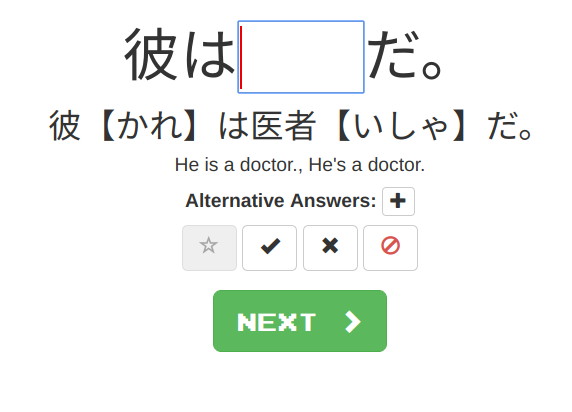 For example, you are given a sentence in Japanese, and with a specific word missing. The clue for the missing word will be in the English translation of the sentence. You have the option of multiple choice or text input before you start each round. If you are in text input mode and get stuck, just click on the “?” button to the right of the Japanese sentence to view the 4 multiple choice options. Writing the correct answer earns you points – the closer you are to mastering the word, the more points you earn. Text input gives you twice as much points compared to multiple choice, so this is what I choose unless I only have a very short time to practice. As you can see from the image above, you can set yourself a daily points target and email reminders to get in your daily practice too. My daily goal is 200 points currently, but I normally aim for 500-1000 depending on how much time I have. Studying using the Play button is for learning new words (although some words that you have encountered before will appear too). For words that you have seen before, you will want to click on Review instead. The Review function is based on spaced repetition intervals like those used in Anki and Memrise – the more often you answer correctly, the longer it will be before you see that same sentence again. Reviews tend to earn you a lot more points than studying new sentences. Clozemaster also has a listening practice feature called Cloze Listening, as shown above. To access this, click Play and then choose “Listening” from the drop-down menu (the default is vocabulary). Cloze Listening is where you hear the sentence first, then have to fill in the missing word in the sentence. I think this makes for great listening practice as well as for learning vocabulary in context. Unfortunately, having a free account only allows you to do one round of 10 sentences to do every day. The points you earn from your study sessions allow you to level up. Every time you do level up you get a fun little gif as a reward, which never fails to put a smile on my face! 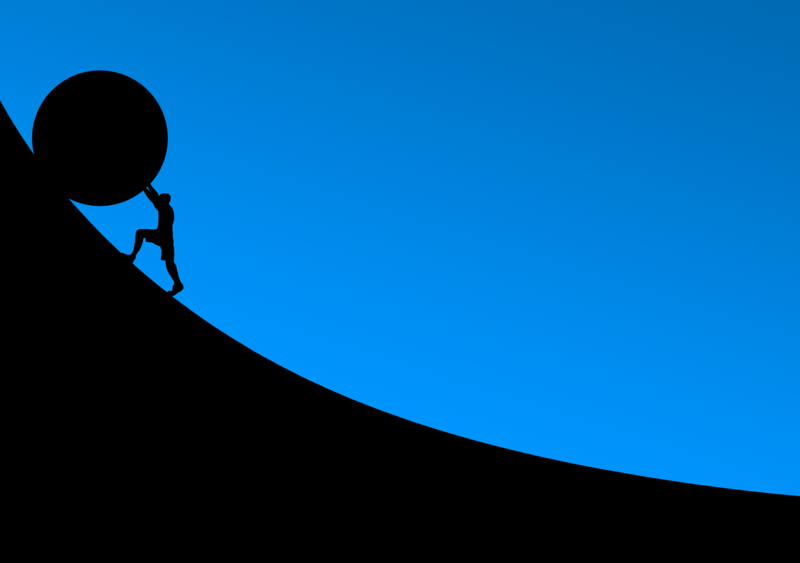 There are two types of levelling up – one for your whole account and one that relates specifically to each of the language pairs you study. Every language pair has its own set of leaderboards, where you can try and score the most points for that week. I didn’t think that I would care about scoring highly on the leaderboard at first. 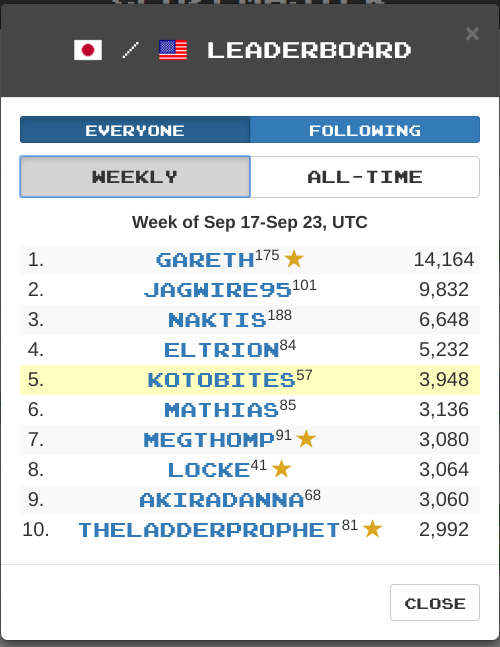 However, if there is someone I am close to overtaking, I will do the extra reviews to move up the leaderboard! I tend to use the web version of Clozemaster, but there are apps available for iOS and Android. I have used the Android app and I do not have much to say about it. I mean that as a good thing – because I have not had any issues using it at all. The fairly plain style of the website translates well into an app, and having the app is really convenient for a quick study session. It is synced to your account, so it is easy to switch between the website and the app if you need to. Make sure you have some sort of Japanese keyboard installed so that you can type in Japanese. From what I can see, there is no support for romaji in direct input mode when using the app. Customise the number of reviews you want to do in each session and control how often you review new words. Download the Fluency Fast Track sentences or sentences you mark in your Favourites for offline study. Get access to additional features such as Cloze-Reading, Cloze Collections and Pro Groupings. Cloze-Reading is designed to help you boost your reading skills. This is where there are several missing words from a native piece of text in your target language which you then need to fill in. The Cloze Collections function is in beta currently, but allows you to curate your own bank of sentences. This can be a mixture of sentences from within Clozemaster and sentences that you add yourself. I think this would be especially useful for language pairs that do not have a large number of sentences already on Clozemaster. Pro Groupings allows you to break down the large bank of sentences into smaller ones. 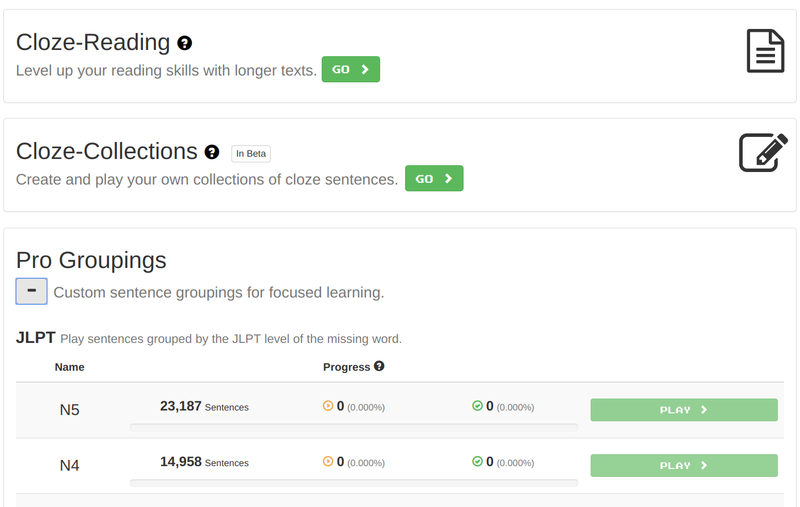 For Japanese, Pro Groupings gives you the ability to focus your learning on words from different levels of the JLPT. Japanese sentences and English translations are taken from the Tatoeba database, which is known for not being 100% accurate. You have to type most vocabulary in kanji (as opposed to hiragana), which might be difficult for complete newcomers to Japanese. I’m sure that the cloze deletion sentences can be replicated in something like Anki easily, which is what I would recommend to people who like a high degree of customisation. 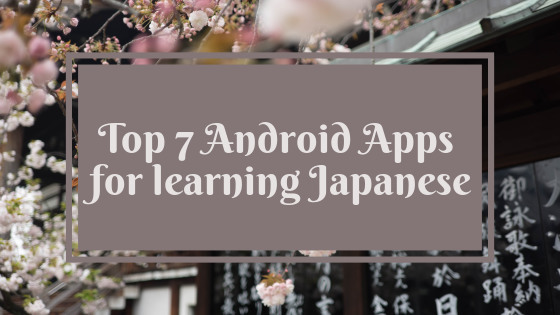 There are also excellent websites such as Delvin Language and Supernative which are specifically for Japanese and do have audio to go with their sentences. However, for me Clozemaster is great because of the gamification aspect, as well as the fact I can practice on the go via the app. 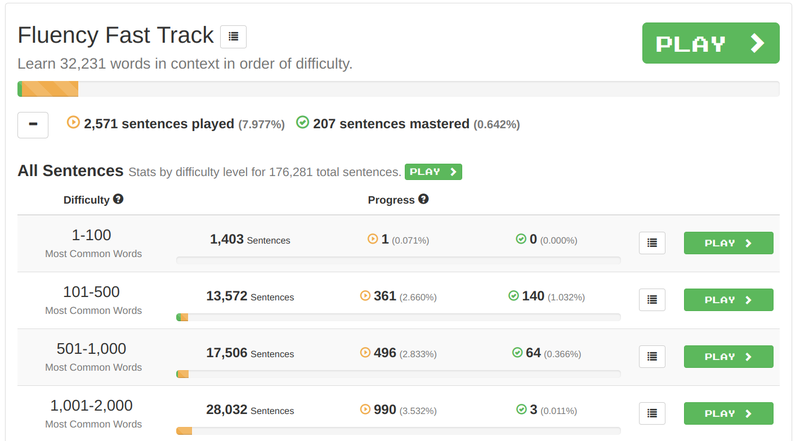 I would also give Clozemaster a go if you are learning (or maintaining proficiency in) a number of languages, as it is super simple to switch between languages and track your progress in each. I really like Clozemaster, but I am not sure that for Japanese the features are fully fleshed out enough for me to justify the subscription cost of $8 per month at the moment. Having said that, there are new features being built into Clozemaster all of the time and I will certainly keep an eye out for any which might change my mind. The good thing about Clozemaster is that you do not even have to sign up to try out the site – just choose a language pair and click Play to get started (which is what I did for a few days before even signing up)! Whether you find that Clozemaster is useful for you or not, one thing I recommend checking out is the Language Challenge of the Day (or LCOD for short). These little challenges are fun ways to use your target languages in different ways every day. Do you use Clozemaster? Do you find the website/ app useful? Please let me know in the comments! 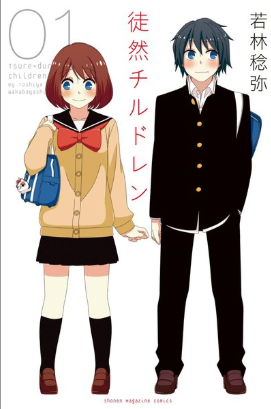 Today’s easy manga recommendation for Japanese learners is Tsuredure Children/ Tsuredure Chirudoren (徒然チルドレン), created by Toshiya Wakabayashi. This is a very funny but heartwarming manga which those who are upper beginners and above should be able to enjoy! This 4-panel manga is a series of short stories involving different students at a high school. The stories are usually to do with romance, mostly relating to awkward confessions of love and first dates. They often remind you of how hard it can be to show your feelings for someone as a teenager. Some stories follow the same characters and are loosely connected to each other. Tsuredure Children started as a webcomic when it started in 2012, which was then serialised in Shonen Jump magazine. Why do I recommend the manga? The premise is really simple, but the manga is genuinely amusing and accurately portrays all of the awkwardness and excitement of high school romance. The cast of characters come across as a bit wacky but ultimately charming and relatable for the most part. You really do come to root for a happy ending when reading these stories! I think that the 4-panel manga format is effective in telling these stories – they are just the right length for them to be entertaining and engaging. Thanks to the straightforward plot, this manga is very easy to follow. There is furigana for all kanji and speech tends to be short and not too grammatically complex. On the other hand, the characters are in high school and speak casually. On this basis, I consider this manga to be appropriate for JLPT N4 or upper beginner level and above. 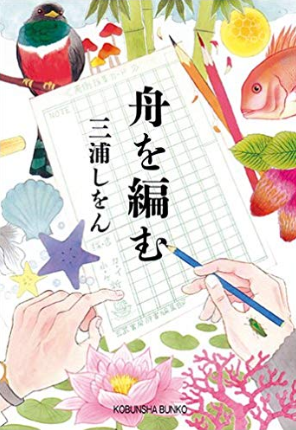 As always, you can read a sample of this manga on the EbookJapan website to get a feel for its difficulty by clicking the white ‘無料立ち読み’ button. 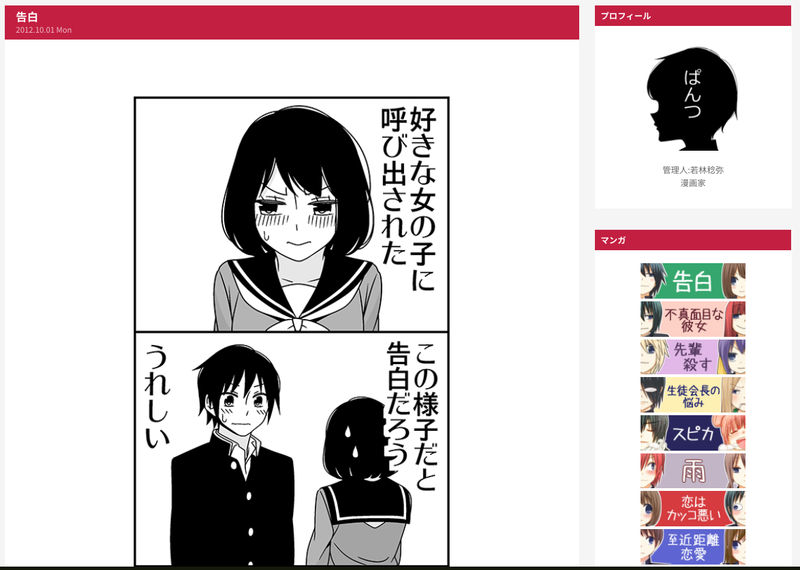 The webcomic is actually available online to read for free on the official website – the only difference is that this version does not include furigana. There is an anime adaptation of this manga which is available on Crunchyroll and Funimation. If you do try reading any of my recommendations, please let me know how you get on the comments. I am always on the hunt for beginner friendly manga, so if you have any suggestions please let me know! As the title suggests, my relationship with Anki has its ups and downs. I haven’t been using Anki for Japanese vocabulary reviews on a regular basis for a couple of months, which I have been feeling guilty about recently. The main reason for my guilt is that when I am consistent with Anki, I retain so much more information. Unfortunately, the problem I have is that I always end up falling off the bandwagon. A few months ago, I was doing a pretty good job of keeping up with Anki reviews. I felt that I was retaining more vocabulary, especially in conjunction with daily tadoku reading. At first, I could get my reviews done in 20 minutes or less, which felt achievable even on a busy day. But then I realised that I was spending more and more time reviewing cards – my review sessions were now at least 40 minutes. I began to dread opening up Anki and seeing how many minutes it would be until I finished my reviews, especially if I had missed a day. I stopped reading in Japanese as much because I felt that I needed to prioritise flashcards instead. It seemed as if my Japanese study was being entirely dictated by Anki reviews and not any of the more exciting stuff. So at that time, sticking with Anki didn’t feel like the sensible choice and I stopped using it. For the record, I do like Anki (and similar spaced repetition programs) a lot, but I find that after a couple of months I get burned out and have to take a break. This is probably the third or fourth time I have been in this situation, so I thought I would take a step back and think about how to be more consistent. I was using shared decks, which can be great, but it meant that there were words I was learning that I didn’t have any real interest in learning. 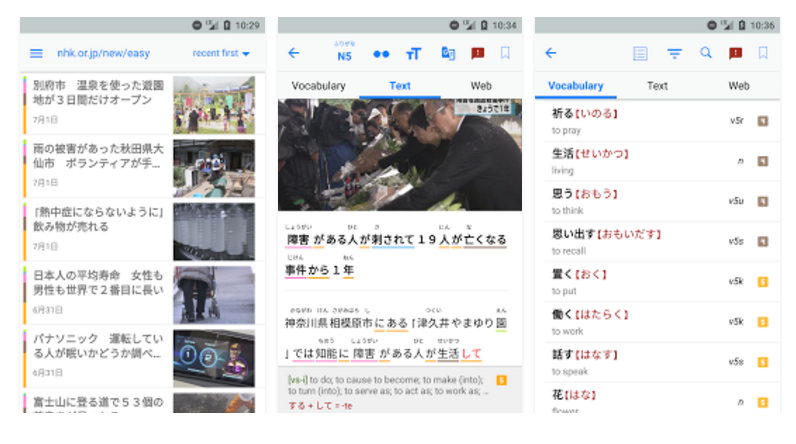 I usually add interesting words I come across directly from Akebi (a wonderful free dictionary app) into Anki, which I find easier to learn because I discovered them in a context that interests me. Eventually, I want to transition to making all of my flashcards myself but thinking more carefully about what vocabulary I want to learn is a good first step. Using the Pomodoro technique could work, but as I find it difficult to focus solely on flashcard reviews for 25 minutes at a time, I will change the time spent a little bit. I think I should be looking at focusing for 10 minutes at a time, perhaps at different times of day (eg. 10 minutes in the morning, 10 minutes during my lunch break, 10 minutes in the evening). Flashcards are not a replacement for reading, listening and speaking the language. For every 10 minutes I spend in Anki, I want to be spending another 10 minutes practicing Japanese in another way that I enjoy (such as reading, or watching TV shows). If you miss a day, the number of cards that I had to review the next day was very disheartening. Going forward I will experiment with how many cards I can comfortably review in about 20 minutes, and set a limit accordingly. It is very easy to conflate recognition of a kanji with knowing how to write it, which doesn’t help me in the long term. So following on from my previous point, I want to limit the number of cards I review, and then I can spend more time reviewing each card in more depth. There are a lot of ways to customise Anki, and I think that making better use of these will help me stay engaged with my vocabulary reviews. It’s going to be a bit tough getting back into the rhythm of daily Anki reviews again, but I hope my new approach means I can keep an Anki habit for longer! Japanese has a lot of first-person pronouns (‘I’) and second-person pronouns (‘you’) in particular, the choice of which is dependant on the relative status of who you are and who you are talking to. In English, we use pronouns all the time and when talking to a superior we tend to change our phrasing rather than vocabulary to show respect. So when we hear words such as in Japanese TV shows and anime, it is easy to think that pronouns such as 私 (watashi) or 俺 (ore) for ‘I’, and お前 (omae) or あなた (anata) for ‘you’ are largely interchangeable. A case that came up in the news recently goes to show why the choice of pronouns in Japanese is so important. The incorrect use of the pronoun お前 led to the resignation of Ryoichi Yamada, a superintendent in Niigata prefecture. In June 2017, a boy committed suicide as a result of school bullying. On the 11th October, Mr. Yamada arranged a meeting with the boy’s family to offer his apologies and discuss what can be done better going forward. Unfortunately, during this meeting he referred to the father as お前 when asking a question. He did later apologise for using the word, but the damage had been done and he tendered his resignation the following day. Why was using お前 inappropriate? お前 is a highly informal word meaning ‘you’. As you would expect for an informal word, you would only use it . Even so, a close friend could take offence at being referred to as お前. It is more often used used amongst males than females. With this in mind, it is not hard to see why there has been outrage over his choice of words. In this case, Mr. Yamada had taught the boy’s father in the past. This is the reason why the superintendent may have thought using お前 would have been acceptable. However given the situation, one would expect the superintendent to be using extremely humble language, and so the use of お前 was highly insensitive. I would be very wary of using words like this, especially as a beginner to Japanese. Part of the following video by Japanese Ammo with Misa explains from a Japanese perspective why learners should refrain from words like omae. Note: the whole video is great, but I’ve set it to start from the part where she talks about Japanese pronouns. It is assumed that I am the one who likes fish even though I didn’t use the word 私(watashi). Therefore, it is more natural not to use pronouns at all. Ms. Ohara, when did you come to America? You can also refer to someone using their occupation or status. Teacher, when did you come to America? [Police] Officer, where is Tokyo station? If you are interested in knowing the different words for ‘you’ in Japanese, this video on second-person pronouns explains the contexts in which you can and cannot use various words. Pronouns are a tricky thing to get used to, and there are also gender and regional differences in usage too. I recommend sticking to the above tips until you’ve been exposed to the language enough to get a feel for when certain pronouns should be used. As I did in the last Tadoku Tuesday post, I am going to write about two books I have read recently or am reading. I’ll also include any new additions to my book collection. Both of the novels I focus on here happen to be by two famous contemporary Japanese authors, Banana Yoshimoto and Kotaro Isaka. It’s a little bit difficult to give an overview of the plot for this novel, but I have tried my best! Sakumi is dealing with two major events in her life; memory loss caused by an accident as well as the death of her younger sister Mayu. Prior to the accident Sakumi had been making ends meet with a part time job, but then realises that she wants to pursue a career in writing. Her little half-brother Yoshio then develops telepathic abilities. As her memories begin to resurface little by little, she begins to come to terms with the circumstances of her sister’s death and gains the courage to work towards what she truly desires in life. I’ve previously written about another of Yoshimoto’s novels before, which had not been translated into English. This time I thought I would try reading one of her more famous novels, which on the whole has been well received. I wouldn’t say that the plot is particularly enthralling, although there are some interesting characters which help keep the narrative engaging. There are lots of dream like passages, which give the novel a mystic feel and are vividly depicted. Despite this, Sakumi as a narrator feels very grounded and relatable, even though situation she finds herself in is not. This is a fairly long novel that has been split into two parts. I have finished the first half of the book and enjoying it so far, but knowing that there is another 200+ pages to read I do wonder what developments are going to occur which will keep me interested. If I had to estimate the book’s difficulty in terms of language I would probably put it at JLPT N2 level. 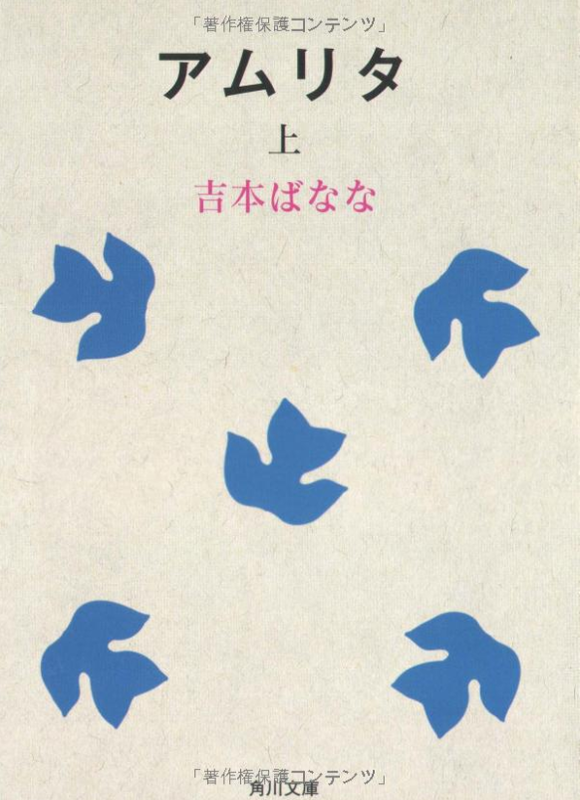 Banana Yoshimoto’s writing style is on the whole quite straightforward, although at times there can be long rambling sentences that might take a bit of careful reading. This novel is actually a compilation of several short stories, which all involve the same narrator. Our narrator is only known as Chiba and works as a agent of death (a Grim Reaper of sorts). As an agent of death, his task is to spend time with the person he is assigned to, and decide within seven days if that person should die. 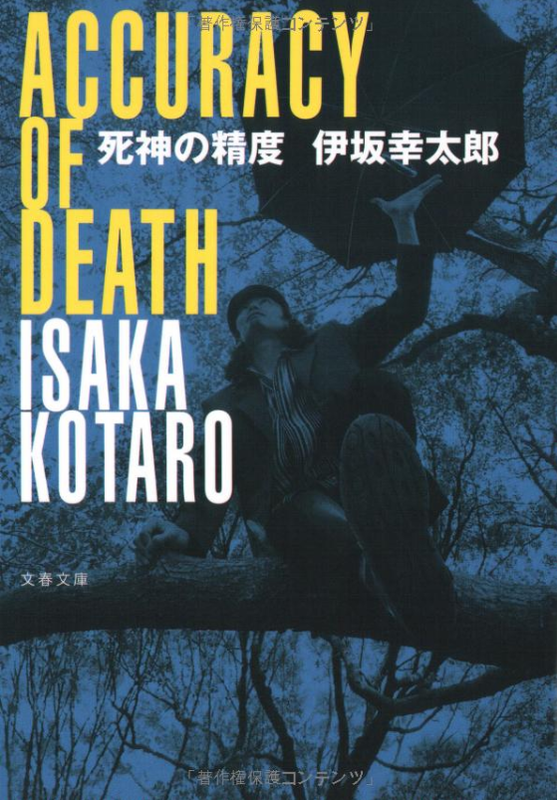 This is the first novel I have read by Kotaro Isaka, and I really enjoyed it. Like Amrita, this novel also looks at the themes of life and death. Having said that, the tone of this novel is completely different. Isaka has written stories spanning many genres, and elements of this come into play in the novel. He somehow manages to infuse the variety of short stories with suspense and comedic moments in a very satisfying way. Being a death god, there are a lot of ‘fish out of water’ moments where he is trying to understand human feelings and motivations. This provided a lot of humour that I was not expecting. There is a wide variety of characters presented in the stories and through the narrator’s eyes, we get to learn a lot about the people he is assigned to. I found it very easy to get engrossed in each of the stories. In terms of language level I’d probably recommend this for JLPT N3 level learners. I think this would make an ideal choice for someone looking to read their first novel in Japanese! I find Isaka’s writing style easy to follow; he tends to write in shorter sentences that still manage to convey a lot of information. Being a series of short stories, it is much easier to digest than attempting to read a longer novel in one go. There is a sequel called 神様の浮力 “The Buoyancy of Death” which was released a few years ago. I would like to read this in the future, although the novel seems to have more mixed reviews from fans of the original. I will certainly be reading more of his works in the future, although with such a large catalogue to choose from I will struggle to decide what to read next! Mitsuya Majime is an introverted man with a passion for reading. He takes the opportunity to transfer from the sales division to the dictionary department, where he is under the guidance of the highly regarded editor Kohei Araki. Araki’s team is undertaking the task of completing a dictionary called “The Great Passage”. The book follows the team’s pursuit of making the very best Japanese dictionary. This has been on my wishlist for a long time, so I was super happy to finally buy this book! Given the subject matter, this could be a bit of a tough read in Japanese. Fortunately, I also purchased the ebook version of its English translation (“The Great Passage”) which I can use to help me with any tricky parts. I haven’t yet decided whether to try and read both versions in parallel or not. There’s also an anime adaptation and a live action film, so I think starting with one of these two to give me a grounding in the plot and characters will make reading the novel a little bit easier. So that’s it for today’s post – you can take a look at アムリタ and 神様の制度 on the Amazon JP website and read the first couple of pages if you are interested in checking them out. What are you reading at the moment (in Japanese or otherwise)? Do you have any recommendations for me? Let me know in the comments! Knowing where to start with Japanese music can be a bit of a minefield. On top of that, finding songs you can study Japanese with is even harder. Or perhaps you often go to karaoke, but never know what songs to sing? Look no further – here is a list of 15 easy Japanese songs to get you started! The songs on this list have been chosen because they are popular songs which also have simple Japanese lyrics. Similarly, I’ve tried to include a mix of older and newer songs. I wanted to write this post to show the wide range of Japanese music. Sometimes I worry that it can be hard to see past the idol music sometimes! I hope that this list will be a helpful starting point for discovering all sorts of Japanese music. This is the oldest song on the list but a definite classic. Known as “Sukiyaki” in English, this is one of the best selling singles of all time. I’m not sure why this is because it has no connection to the lyrics! It is also one of the few foreign language songs to reach the top of the US Billboard Top 100 chart. The upbeat sound of the song contrasts with the sadness of the lyrics. The song tells the story of a man who looks up and whistles to stop tears from falling. The lyrics are simple and repetitive, which makes it a great Japanese song to study with! The recently disbanded boy band SMAP were very much a national institution, having a career spanning almost three decades. Besides music, the band’s members expanded into acting and hosted one of the most popular variety shows of all time, SMAPxSMAP. Their biggest song (The One and Only Flower in the World) was released in 2003. It was an instant hit, selling over a million copies. The song’s simple lyrics and pacing make it a karaoke favourite even today. This single by singer-songwriter Angela Aki was released in 2008. Originally featured in a NHK documentary, it became popular again after the March 11 tsunami disaster and is still heard at graduation time today. I think it perfectly encapsulates what a lot of us would write a letter to our younger selves. It’s a song with a great message and certainly one to listen to when you’re feeling a bit down. By the way, 拝啓 (はいけい/ haikei) is how you traditionally start off a letter in Japanese. Utada Hikaru is one is Japan’s most famous contemporary artists – it was tricky to pick a song from her many albums. First Love was Utada’s third single, taken from the album of the same name which went on to over seven million copies in Japan. That’s not bad considering she was just 16 years old at the time! This easy Japanese ballad has a mix of Japanese and English, and is likely to be a karaoke favourite. Kyary Pamyu Pamyu is the stage name of Kiriko Takemura. Takemura started as a blogger and model before entering the music industry. Her 2011 single PONPONPON was the first of her singles to become a viral hit. The catchy beat is the invention of famed producer Yasutaka Nakata, who is also the creative force behind pop trio Perfume. The song and music video are the epitome of cute. Together with the simple lyrics, this is a very easy song to get stuck in your head (you have been warned!). Ikimonogakari are a pop-rock band that have been around since 1999, although they are currently on hiatus. The band’s name refers to the group of children assigned the task of looking after plants and animals in Japanese primary schools. Arigatou is a song they released in 2010 and is about treasuring a loved one. The lyrics are very sweet, and the tempo of the song makes it a good choice for singing at karaoke! Mika Nakashima is a singer and actress from Kagoshima prefecture who debuted in 2001. As an actress, she is probably most famous for her role in the live-action adaptation of the shojo manga Nana. Her single Orion was released in 2008 and is one of her many popular singles. In this song, Mika sings wistfully about a past love. The lyrics here are slow and not too difficult which makes it a nice song for Japanese learners. The Blue Hearts were a punk rock band popular in the 80s and 90s. Linda Linda is one of their most popular singles and remains a karaoke favourite. Originally released in 1987, the song was a key part of the film Linda Linda Linda (2005), where 4 high school girls form a band which covered several songs by The Blue Hearts. Crystal Kay is a singer hailing from Yokohama, who released her debut single at just 13 years old. Koi ni Ochitara was her seventeenth single released in 2005 and was the theme song for a drama of the same name. This pop ballad is probably the least well known on the list, but it has simple but sweet lyrics perfect for karaoke! Nada Sou Sou is an Okinawan phrase which means “large tears are falling”. In standard Japanese this would be 涙がポロポロこぼれ落ちる/ namida ga poro poro kobore ochiru. The song tells the story of someone looking through a photo album of someone who has died. The original song was performed by Ryoko Moriyama, but it is Rimi Natsukawa’s version released in 2001 that steadily became a hit. It was so popular that broadcaster TBS made two dramas and a film between 2005 and 2006. The song is sad but beautiful and certainly a Japanese song worth knowing about. Babymetal have a unique blend of metal and idol style music (now known as “kawaii metal”). Babymetal formed in 2010 and consists of three members: Suzuka and Moa. Since their formation, they have performed in many places around the world. The group’s 2016 song Karate is from their second album Metal Resistance and is all about never giving up in difficult times. A lot of the main phrases are repeated and overall the lyrics are not too tricky. This is a definite crowd pleaser at karaoke! I don’t think it is possible to escape Arashi, the five-piece boyband who have been together since 1999. Like SMAP, each member is involved in TV hosting and acting. Released in 2010, Monster was the theme song for the drama adaptation of the manga Kaibutsu-kun which starred member Satoshi Ohno. The lyrics are straightforward – if you are in the mood for a Halloween pop song then this is for you. Kiroro are a duo who released their first single in 1998. Both members Chiharu and Ayano are from Okinawa. However, the name of the band was actually inspired by words in the Ainu language after visiting Hokkaido. The song Best Friend was released in 2001, and was the theme song for a drama called Churasan. It is a popular song to sing at graduations, as the song relate to appreciating close friends. Greeeen (the 4 e’s represent the four members of the group) are a pop-rock band originating from Fukushima prefecture. Kiseki was released in 2008 as the theme song for the baseball drama Rookies, and quickly became a bestseller. The title kiseki has the dual meaning of 奇跡 (meaning “miracle”) and 軌跡 (meaning “path, track”), which is why it is written in katakana rather than kanji! The lyrics aren’t too difficult and emphasise how important it is to treasure each moment and to keep moving forward. AKB48 are a massive girl group with several best-selling songs to their name. Named after the area in Tokyo where the group are based (Akihabara), the idol group is split into teams that hold performances there every day. Released in 2013, the message of Koi Suru Fortune Cookie is to try positive about the future, because you never know what will happen tomorrow. I am not the biggest AKB48 fan but you cannot deny that this song is incredibly catchy, upbeat and has a fun dance to learn too! So this turned out to be a very long post! It’s always good to have a shortlist of songs when going to karaoke. Hopefully this post has given you a few ideas (it was certainly fun writing this post). If in doubt, you can’t really go wrong with good old Disney songs in Japanese! What is your favourite Japanese song? Let me know in the comments! 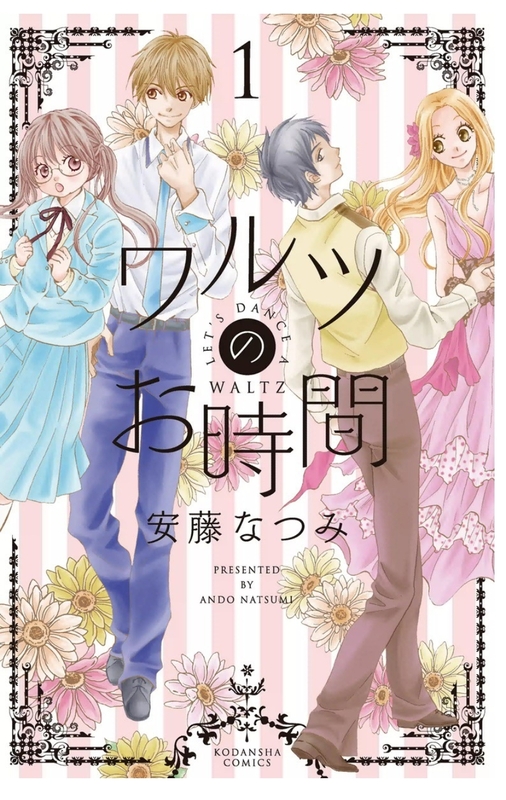 Today’s manga recommendation for Japanese learners is ‘Let’s Dance a Waltz’ / Warutsu no Ojikan (ワルツのお時間), a manga series created by Natsumi Ando. Tango Minami is a high school student whose family run a ballroom dance studio. Having danced from a young age, he teaches at the studio to earn pocket money but keeps his connection to the dance studio a secret from his school friends. One day, a girl turns up looking for a trial lesson. The girl, Hime Makimura, is a shy student who is looking for a way to break out of her shell. Hime falls with love with dancing from the very first lesson, but Tango realises that they are both in the same class at school! Can Tango manage to keep his ballroom dancing a secret, whilst helping Hime to become a better dancer? First things first, this is in many ways a typical shojo manga – the female protagonist is a shy girl who learns to find confidence in herself, assisted by the charismatic and popular male lead. The plot develops pretty much exactly as you would expect from this genre of manga. Having said that, the ballroom dance aspect helps to keep the narrative feeling fresh. Hime (meaning ‘princess’) really hates her name as she feels she could never be a princess in anyone’s eyes. Therefore it is heartwarming to see her find a natural talent and passion for ballroom dancing. Whilst this is a ballroom manga, the manga is more focused on the emotional impact dance has for Hime. Tango also grows as a person through his interactions with Hime, which helps him feel like a more rounded character by the end. At just three volumes, this manga is a short but enjoyable read. I consider this manga to be appropriate for JLPT N4 or upper beginner level and above. You may be surprised to learn that the vocabulary used in this dance-themed manga is not too difficult. There are a few terms that are specific to dance, and these terms tend to feature a lot of English loanwords. As the main protagonists are high school students, there is a bit of slang used but if you are used to manga slang conventions, this should not pose too much of a problem. As always, you can read a sample of this manga on the EbookJapan website to get a feel for its difficulty by clicking the blue ‘無料立ち読み’ button. If you do try reading any of the recommendations, please let me know how you get on the comments. I am always on the hunt for beginner friendly manga, so if you have any suggestions please let me know!